For the most part, commands in the Distort submenu are related by the fact that they move colors in an image to achieve unusual stretching, swirling, and vibrating effects. They're rather like the transformation commands from the Layer menu in that they perform their magic by relocating and interpolating colors rather than by altering brightness and color values. The distinction, of course, is that whereas the transformation commands let you scale and distort images by manipulating four control points, the Distort filters provide the equivalent of hundreds of control points, all of which you can use to affect different portions of an image. In some cases, you're projecting an image into a fun-house mirror; other times, it's a reflective pool. You can fan images, wiggle them, and change them in ways that have no correlation to real life, as illustrated in Figure 11-12. 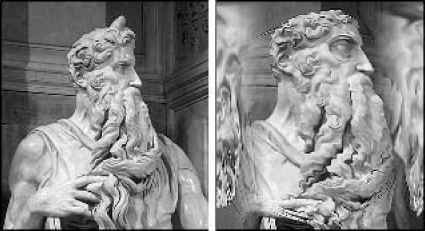 Figure 11-12: This is your image (left); this is your image on distortion filters (right). Three filters, in fact: Spherize, Ripple, and Polar Coordinates. ♦ Practice makes practical: Distortion filters are like complex vocabulary words. You don't want to use them without practicing a little first. Experiment with a distortion filter several times before trying to use it in a real project. You may even want to write down the steps you take so that you can remember how you created an effect. ♦ Use caution during tight deadlines: Distortion filters are enormous time-wasters. Unless you know exactly how you want to proceed, you may want to avoid using them when time is short. The last thing you need when you're working under the gun is to get trapped trying to pull off a weird effect. Ripple filter twice. Finally, after establishing two heavily feathered vertical columns on either side of the image in the quick mask mode, I applied the Polar Coordinates filter, which reflected the front and back of the head. Turn the book upside down and you'll see a second face. 4 Combine creatively: Don't expect a single distortion to achieve the desired effect. If one application isn't enough, apply the filter again. Experiment with combining different distortions. Caution Distortion filters interpolate between pixels to create their fantastic effects. This means the quality of your filtered images depends on the setting of the Interpolation option in the General Preferences dialog box. If a filter produces jagged effects, the Nearest Neighbor option is probably selected. Try selecting the Bicubic or Bilinear option instead. If none of the distortion filters does the trick, investigate the new Liquify command, found on the Image menu. With this one command, you can warp, twirl, shift, and otherwise distort your image by dragging on the image in a preview window. 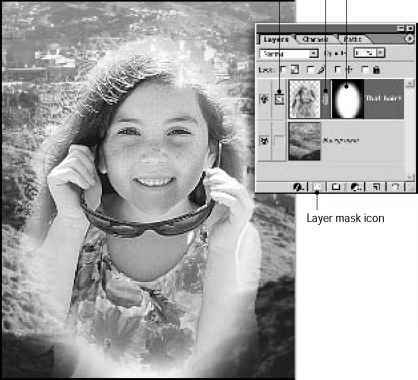 The section "Distorting with the Liquify command" explains how to use this tool.